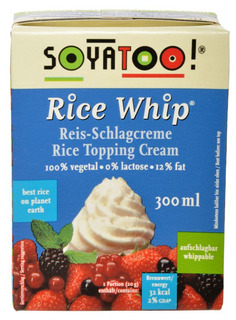 Soyatoo Rice Whip is a vegan alternative to dairy-based whipped cream. You can whip the topping cream just like diary-based cream and use it for desserts, cakes and more. Furthermore Soyatoo is cholesterol free and low in fat. Please shake well before use. Refrigerate after opening and consume within a short period of time.